VIP Odessa apartments near Deribasovskaya Str offered by owner. Apartments for rent in Odessa, Ukraine: best prices, large selection. Find your next Odessa apartments for rent in our hotel! Please fill out the form to reserve your apartment of choice or contact us any way you prefer - by phone or e-mail. 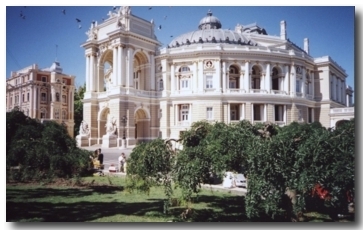 We offer Odessa Opera tickets. Email for details. Odessa is one of the oldest cities of the eastern Europe, having been through several huge changes, among which the latest and most important was event of the collapse of the Soviet Union, which brought Ukraine and Odessa consequently in a position to deal with the new capitalistic system, trying to escape from the heavy influence and shadow of communism, which is still obvious everywhere. The city exists from the antiquity as a major Greek colony, but as we know it today, it was born two hundred years ago, when Catherine the Great needed a port that exits to the Black Sea, so as to expand Russia’s business in trade and defeat the Turks of the Ottoman Empire who were still occupying parts of the Eastern Europe. Catherine brought famous architects from Italy and France and they designed and built a marvellous city, which still remains as it was. Odessa’s old city is gorgeous and you cannot help it but fall in love with the picturesque buildings and streets with the western European style still vivid and intense. Thankfully big parts of the old city are restored and regained the charm of their past. Deribasovskaya Street is the epicenter of the traditional old city, turned into a very commercial district now with a wide range of shops and fairs. During the summer months, this is the place to go, as it is considered hot spot for people watching, as there are numerous outdoor cafés and many young and fashion people around. Built in 1837 the Potemkin Steps are the ideal spot to go and see the Bay and the Harbor. The Primorskjj Boulevard will lead you to the monuments of the Tsars and the notorious Soviet generals, while when you get down to the steps you can see the new passenger Port. Frantsuskij Boulevard was the place where merchants used to have their businesses and was one of the most important for the city’s economy areas, but numerous sanatoria exist there now, reminding in nothing the old atmosphere .If you ask the Odessites what is the most defining part of their city they will show you the cobblestone paths and acacia trees as the most reminiscent of Old Odessa. One of the most popular districts in Odessa is Arcadia Beach, almost ten kilometres from the city centre, a place where cafés and restaurants exist in abundance and are the main attractions for tourists during the summer months. There are several beaches along the coast, crowded during the summer months but always worth visiting, such as the Lanzheron, Otrada and Delfin. Transportation in Odessa is relatively good and easy to follow, as there are cable cars, trolleys and buses and of course numerous taxis and transport services offered in very reasonable prices, while the rail system of the city connects it will all major European cities. Actually arriving in Odessa is the easiest thing you can do. Afterwards, an entire city is waiting for you to show the beauties of its past and the potentials of its future. Our Odessa Apartments - As Odessa Hotels are becoming increasingly expensive and lack the quality with which Western tourists are accustomed – we offer a fantastic alternative in the form of centrally located Apartment Hotel "Paradis". Our customers typically save 30 to 40 percent of the cost of expensive hotels in Odessa and our apartments have lots of extras, like fully fitted kitchens and high-speed internet, allowing you further savings without compromising quality. Please read on to see why staying on our apartments is a great way to enjoy everything Odessa has to offer. Booking Terms and Conditions -If this is your first time visiting Ukraine, you may feel strange about renting an apartment instead of a hotel in Odessa. In the USA or Western Europe, it is not common to rent an apartment for a short leisure or business visit to another city. In Ukraine, however, things are different. Booking serviced Odessa apartments in Ukraine , all centrally located and renovated to Western standards makes a lot more sense then reserving overpriced hotels with very limited privacy, comfort and services Please, read this section of our site about apartment booking, rules and policies.Fill up a form on our site and send it to us. We will reply to your request within 24 hours and will confirm your reservation. In case the apartment you have chosen is not available we will offer you other options. Contact Information - if you have an opportunity to visit our fascinating and unforgettable Odessa, please, get in touch with us. Our team will help you to choose the Odessa apartment and book it by phone or via email.